Summary: Ignore the story, there’s not much to it, just get set for a zombie slaughter. 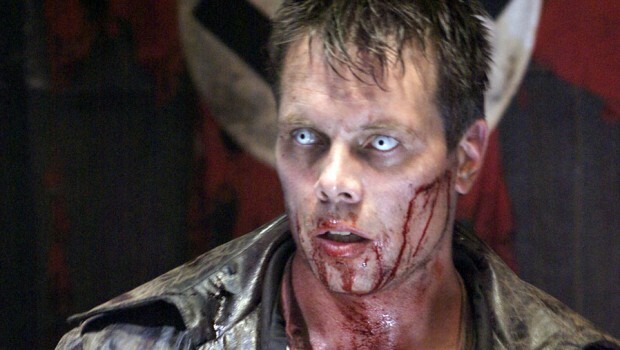 Nazi zombies are possibly the most evil of monsters ever devised, repulsive in both looks and ideology, so War of the Dead scores highly from the off in terms of frightening enemies. Taking inspiration from Norwegian gorefest Dead Snow which saw undead German soldiers rampaging against medical students on a ski trip, this period piece thrusts a platoon of American and Finnish soldiers against their never-say-die enemies. It’s loosely based on real experiments Adolf Hitler’s Nazi scientists performed on humans to test their limits, killing them in the process, and directed by documentary filmmaker Marko Mäkilaakso in what is the most expensive film ever shot in Lithuania. But don’t let those facts fool you – this is first and foremost a hybrid of action, horror and war. War of the Dead sees an American soldier stumble across the classic horror cliché of a cabin in a wood where he finds an old man who has a collection of what look to be runes. Stealing one, he links back up with his group of American and Finnish soldiers and they encounter the enemy who they defeat – temporarily. Yup, one skirmish they are killing their enemies, the next they have to kill them all over again – only this time they are more fearless and harder to kill as they’re already dead. Moving from enemy lines in a wood to surrounded by Nazi zombies in a cabin and then stumbling upon the bunker where the experiment were taking place, War of the Dead is as fast-paced as its undead. These foes are more like the smart zombie seen in 28 Days Later than the lurching oafs that normally manifest themselves, ensuring the soldiers get no easy targets to pick off from a distance. When the soldiers are trapped in the cabin zombies launch themselves through the windows to get at their prey and they aren’t even safe when they manage to find a car and a randomly-placed horse to make a fast getaway. Soon their having to creep around a bunker’s narrow passages like a survival horror video game with every shadow a potential threat. Whatever made Finnish director Mäkilaakso want to try his hand at fictitious films, it was a wise one. He relishes the chance to be outlandish, laying siege to the screen with zombies and giving his soldier heroes no chance for a respite with some duff dialogue about hoping to survive. His stars here are all given a proper workout as they endure a perilous 90 minutes getting covered in blood and mud. Ignore the story, there’s not much to it, just get set for a zombie slaughter.